Visiting Bronx and seeking for a location to swim? Nice choice! Don't forget to tell us how did it go. 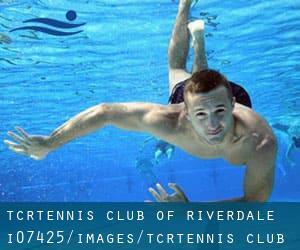 Introducing now TCR/Tennis Club of Riverdale swimming pool, a fantastic swimming pool sent by a swimmer like you couple of days ago. Have you visit this pool? Do you work here? Please, get in touch with us in case you have information that you think is gonna be useful and bear in mind from now on you can now promote every single pool just by sharing this page with your close friends or adding comments in the Facebook boxes below. Come on and help this pool to be the very first in Bronx! Among all of the activities provided by the center, should you be thinking about swimming you will enjoy 25 meters x 10 meters, 4 lanes, Indoors. Just in case you need to get in touch with this Pool prior to dropping by, we only know the phone number. If you believe that any in the data is incorrect, please make contact with us. Help us be better day-by-day. 2 Castle Hill Avenue , Castle Hill , Bronx , NY , USA (Postal Code: 10473). This sports center delivers 25 yards x 40 feet, 6 lanes, Indoors. For this Pool, only phone number is number here. 990 Pelham Parkway South , Bronx , NY , USA (Postal Code: 10461). This sports center provides 25 yards, 4 lanes, Indoors. For this Pool, only phone number is number here. 450 St. Anns Ave. , Bronx , NY , USA (Postal Code: 10455). This sports center delivers 24 yards x 39 feet, 5 lanes, 9 feet depth, Indoors. For this Pool, only phone number is number here. 250 Bedford Park Blvd. , Bedford Park , Bronx , NY , USA (Postal Code: 10468). Among all of the activities provided by the center, should you be thinking about swimming you will enjoy Olympic size x 67 feet, 8 lanes, Indoors. Just in case you need to get in touch with this Pool prior to dropping by, we only know the phone number. 1665 Hoe Avenue , Bronx , NY , USA (Postal Code: 10460). Swimmers like you reported 25 yards, 4 lanes, Indoors. Phone number and email address are number for this Pool.